MADISON, WISCONSIN, UNITED STATES OF AMERICA, December 20, 2018 /EINPresswire.com/ — Ken Jackson’s Guitar has gained good reviews online after its publication. His book serves as a reminder that to the artists, art is life and their life is an art – which definitely gives a moral to every artist who struggles to make it through in their challenges. As the author shares how he continues his passion while rendering twenty years in the penitentiary, he is an epitome of a true artist who made it through even when he was at the toughest moments in his life. 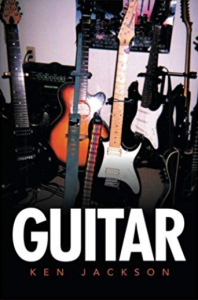 Following the successful publication of the book, Jackson reaches another milestone as a book video for Guitar is set to be released soon. It will give a compelling view of what the author wants the readers to understand. Furthermore, it will show a summary of the most impactful timeline of the author’s life. I started off as a musician in high school, playing guitar and bass. Coming out of high school, I knew some of my own songs as well as those of other artists. I didn't start writing poems for a while though-except in high school for English class, when I wrote a poem that said, “Let's blow up the rotten school and build ourselves a swimming pool,” which raised an issue at school similar to bomb threats in this day and age. Then there was this dirty poem I wrote in my early twenties. But I was still writing songs then. I took some college courses in jazz, piano, songwriting, and creative writing. Back in 1985, I recorded with a famous producer. Butch Vig produced Nevermind by Nirvana, a number-one album of the year in the early nineties. Then, in 1986, I started a twenty-year sentence for a crime. That's when I started writing poetry. I took a course in creative writing from UW–Extension. I wrote a few poems and people liked them, so I wrote more. There came a time when I used poetry as therapy. I would write two poems for every two weeks. And that beats writer's block. A lot of that stuff is in the book Best of Ken Jackson. I was released in '99 and put out a bunch of rock 'n' roll albums. I was also participating in a monthly poetry group for a while. I wrote one section of this book using a variety of student researchers.